It’s likely that this week someone in Britain will die from an accident with a ladder, and more than a hundred will be injured. Most of these accidents occur during household maintenance and DIY, by following some advice many of these risks can be cut down or even avoided. Here are a few examples. If you are in any doubt at all it is better to seek professional help. It may be that for the type of work that you are considering that scaffolding or other access equipment will be better suited to the task at hand. 1. Get the correct ladder. It is important that the ladder that you use is the right height for the job If the ladder is too short you will have to overstretch, if too long then you might have to put it at a dangerous angle. .The ladder that you use should meet the required British standards: BS 2037 (Aluminium) BS 1129 (Wood). All ladders have a load capacity.Make sure that your weight plus that of the tools does not exceed the limit of the ladder you are to use. 2. Inspect your ladder carefully. Do not use a ladder that is rickety or damaged, if you notice that this is the case do not attempt to repair it have it destroyed.Wooden ladders contract in the cold and expand in the heat, so check that the rungs are still firmly riveted, and have not rotten, also look out for any cracks. Check the screws that fasten the rungs on metal ladders as well as the rungs themselves to see that they are fastened and have not been damaged by rust. Carry out any repair work and make replacements as soon as they are noticed. Before each use of the ladders remove dirt that may have accumulated in the l grooves. 3. Position the ladder correctly. Place your ladder on a level, solid surface.The ladder should never lean sideways but should be placed at an angle of 75 degrees from the floor. 4. Provide support at the top and at the base. Be careful where you put the top of the ladder. Make sure that the top surface against which the ladder rests is stable and nonslip. Never rest the ladder on glass or plastic such as guttering. 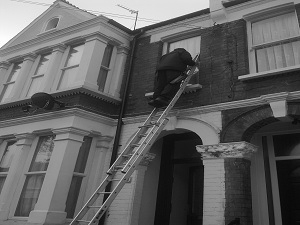 When possible, tie it securely to a fixture, with the top rising about 1m above the top point of the landing.Take particular care that when you initially climb the ladder, you tie it at the top.If the ground slopes away from the building, place something heavy like a sand bag at the base of the ladder or tie a lower to a fixture. If the ground is uneven but solid, use a wedge to get a level base. Provide wooden board to make a firm base if the ground is soft or of loose material.If you use a stepladder make sure that all four steps are firmly on the ground. Flat shoe are appropriate footwear for climbing ladders. Before you climb make sure that the sole of your shoes are dry. Remove anything like mud that might make you slip. If possible carry tools in a holder that is attached to a belt so as to leave hands free for climbing.Be deliberate and methodical, and do not rush. Remember that even a small screw driver can cause injury when dropped from height. 7. Check your state of health. Do not climb if you are on medication, feel sick or nauseated or if you suffer from vertigo. 8. Be considerate of others. If you are working in a public place, make the ladder easily visible, and if you have to move a ladder around a corner, be aware that others will not be expecting this. Shout a friendly warning, and check to see if the way is clear.If you have to go away and you have been unable to tie the ladder securely, get someone to stand guard, or lay the ladder down safely until you return. Always face the ladder when ascending or descending. When on the ladder avoid overreaching by making sure that your belt buckle (navel) stays within the stiles and keep both feet on the same rungs throughout the task.Always have three points of contact with the ladder two feet one hand.Never climb a ladder in strong winds. Do not stand or sit on the top three rungs of ladder. When you extend your arms and legs while working up high, you may make the ladder unstable. Avoid dangerous overreaching. Move the ladder often to keep it close to your work.